Clyde boss Danny Lennon this week distanced himself from speculation linking him with the vacant manager’s job at Raith Rovers. The Bully Wee boss is regarded as a legend at the Fife club, having made almost 200 appearances during Rovers’ most successful period in the mid-1990s. He was also responsible for the famous half-time scoreboard in Munich in 1995 when his free-kick put the Kirkcaldy side 1-0 up away to Bayern. Lennon ranked highly in a poll of fans’ choices to replace Barry Smith at Starks Park. 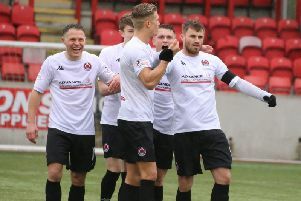 But the 49-year-old, who took over at Broadwood last November, insists he’s happy at Clyde, currently third in League 2, and rates club chairman Norrie Innes as the best he’s ever worked under. After Saturday’s win over Albion Rovers, Lennon said: “It’s a compliment to be linked with any role. “I had a good number of years at Raith Rovers, it’s a club close to my heart where I created some great memories but I’m in a great place at this minute in time. “I’m absolutely loving working with the chairman here at Clyde. “He’s the best I’ve ever worked for, and I’m working with some great directors and good people. “We’ve just got our squad complete and with the infrastructure of this place I love coming to my work on a daily basis.